I rarely watch shows in real time. I only watch DVR’d shows. I go through the DVR every day or so and watch my DVR’d shows. If I am not watching DVR’d shows, I’m watching on Netflix. Unfortunately Netflix doesn’t have every show or even every movie in stock. So I watch whatever shows I can find on Netflix. If I forget to DVR a show or cant find on Netflix, I have to either record the show again or wait for the show to come out on DVD or BluRay. If I find a show I like, I have to “work” to watch that show. So, when I find a show, I will watch every episode in one sitting. I watch House of Cards (U.S. version) over a couple of days after my knee surgery. I binge-watched Orange Is The New Black a few days in to the new school year, when I was so exhausted by life and everything. I started to watch Breaking Bad when I recuperated from knee surgery, but I had to keep turning the TV off when the kids were home. When I strike out on DVR and Netflix, the next best thing is getting a beloved TV show on DVD or BluRay. If I have the DVDs, I can watch whenever I want and wherever I want. I’ll catch up on a show waiting for a kid at soccer practice or hanging at Starbucks going through emails. I was asked to review Season 9 of Supernatural. Truthfully, Supernatural wasn’t on the top of my must-see list, but I had watched a bunch of episodes in Season ?? with my teens and liked it. Dean returns to Earth without Castiel (an angel played by Misha Collins) one year after being dragged to Purgatory. Dean carried inside his body the soul of a vampire named Benny (played by Ty Olsson). The brothers begin a fight against Crowley (a demon played by Mark Sheppard) to find the Demon Tablet and lock the Gates of Hell, thereby trapping all demons in Hell. Castiel, brought back by an angel named Naomi (a mysterious angel played by Amanda Tapping), takes possession of the Angel Tablet. After realizing that to lock the Gates of Hell Sam must die, Dean ends the trials. Castiel, however, is stripped of his grace by an angel named Metatron (played by Curtis Armstrong) who proceeds to have millions of angels locked out of Heaven. Season 9 begins with Sam dying from what happened at the end of Season 8. 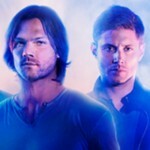 The “exhilarating and terrifying journey of the Winchester brothers” continues with the ninth season of Supernatural. Supernatural Season 9 is from Warner Bros. Home Entertainment Group and is on the CW. Supernatural Season 9 is available on Blu-ray™ for $69.97 and DVD $59.98. Supernatural Season 9 contains all 23 episodes and is packed with over four hours of bonus content, including featurettes, commentaries, a Comic-Con panel, deleted scenes, and a gag reel. The Blu-ray™ also has access to a Digital HD copy of all 23 episodes. You can even follow @CW_SPN on Twitter. Or like Supernatural on Facebook. You can buy the Supernatural Season 9 DVD and BluRay on amazon.com, too. Disclosure: I was sent the BluRay to facilitate my review. The views expressed in this post are my own. Affiliate links are to my amazon account.